Home » VM » Becky’s Kitchen – Not just burgers! 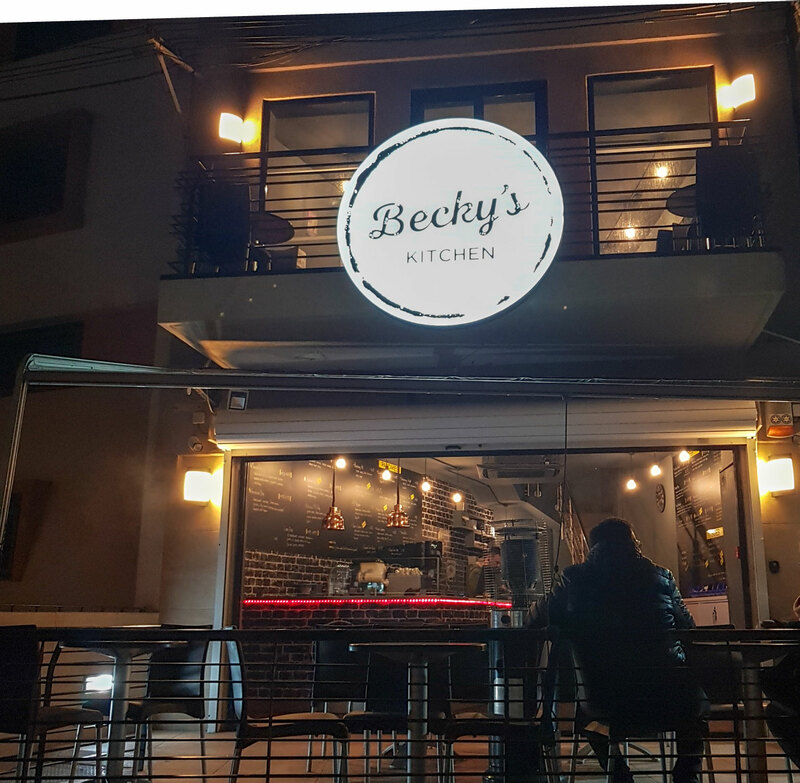 A couple of weeks ago, my partner and I visited Becky’s Kitchen in Naxxar for a quick dinner on a Monday night. I must admit that I drive past Becky’s Kitchen many times a week and I have been dying to try their veggy burgers. Walking into Becky’s kitchen you feel the cool, young vibe immediately. We were greeted by a smiling member of staff who walked us through the order process. Becky’s kitchen is a casual, fast-food style restaurant with a difference. They offer burgers, salads, creative sides and a vast menu of pancakes. Our host pointed out the veggy and vegan options on the menu (which is up on the wall as soon as you enter) and answered all our questions. I have to say, the 2 of us had one thing on our minds- Burgers! A good veggy burger is a bit of a rarity, so we were happy to indulge. For those looking for a more health-conscious option, they do offer 1 vegan salad (€7.95) which is topped with a tasty red kidney and mushroom patty, the same one that is used to make the vegetarian burger (V for Veggie). You can also go for a burger without any sides if you want to limit your calorie intake. In the end, we ordered a vegetarian burger with sweet potato fries and the vegan burger with normal fries. Service is swift, so we picked up our order in under 10 minutes and we could not wait to dig in! 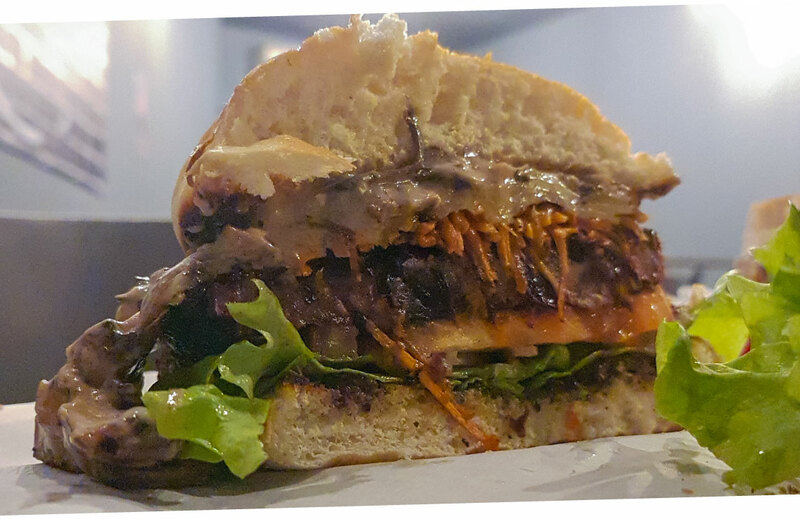 The vegan burger (Madlene) is a made with a vegan meaty patty with lettuce, tomatoes, mushrooms, and slices of sweet potatoes. If you are craving a good old traditional burger, this is the one to dig into. The bun was lightly toasted and the salad was super fresh. The patty is quite a simple vegan burger patty made of soy mince (I think!). The combination together makes a good substitute for those wanting a ‘real’ burger. The burger on its own is €6.75 and it’s an extra €2 for fries and a drink (€9.95). On to the vegetarian burger- V for Veggie. I have to say, the competition was close, but this was the winner for us both! The vegetarian patty itself was delicious, crisp on the outside and succulent on the inside (kidney beans and mushroom base). The bun was smothered with truffle spread and a delicious creamy mushroom sauce. To top it off they added Grana Padano cheese, crispy carrots, and lettuce. So satisfying and tasty, I could not get enough of this burger! If you are into alternative burgers I would definitely recommend the V for Veggie. As a meal (burger, fries, and drink) this costs €9.95, and just the burger is €6.95. The staff is super friendly and accommodating. When I asked about making the V for Veggie a vegan option, they immediately said it would not be a problem. They were happy to chat with us about the different vegetarian options available, possible substitutions and answer questions about the menu. Even though I didn’t taste the pancakes, I would not be surprised if patrons visited the restaurant just for one of their divine desserts. It’s not over until dessert! The portions are generous, to put it mildly, so much so that we could not finish the whole meal. We left Becky’s kitchen satisfied but with no room for dessert. Next time I will be coming for the pancakes!